I got it years ago when I still had hair. 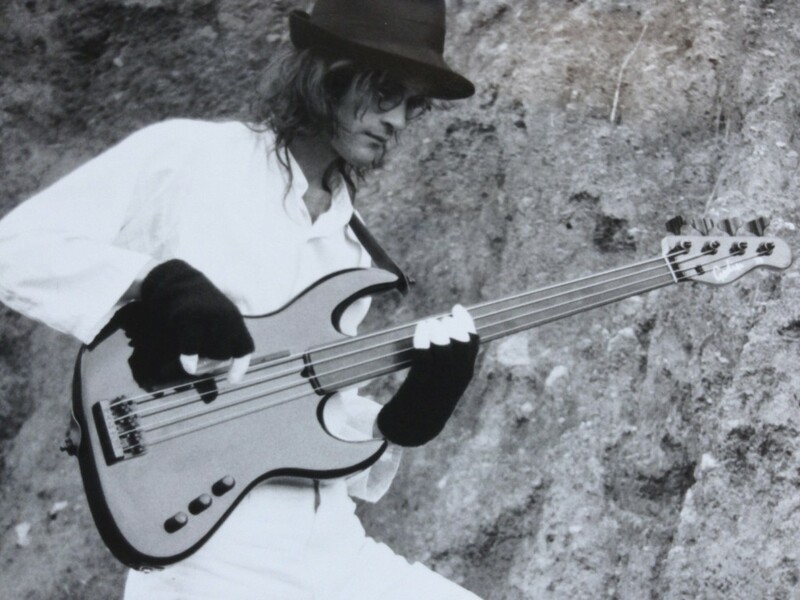 It is the good old Godin Z-1 fretless 4-string bass with the Zeta piezo bridge and a long wooden thumb-rest. No visible pickup, some crystals doing all the magic, active tone control with bass/treble and a volume knob. It was meant to sound very acoustic, a bit like a double-bass but it didn’t. Its sound always reminded me of the plastic sound of an old Ovation guitar, just an octave down and without frets. But I loved it and I still do love it. And I love it again as you will see. 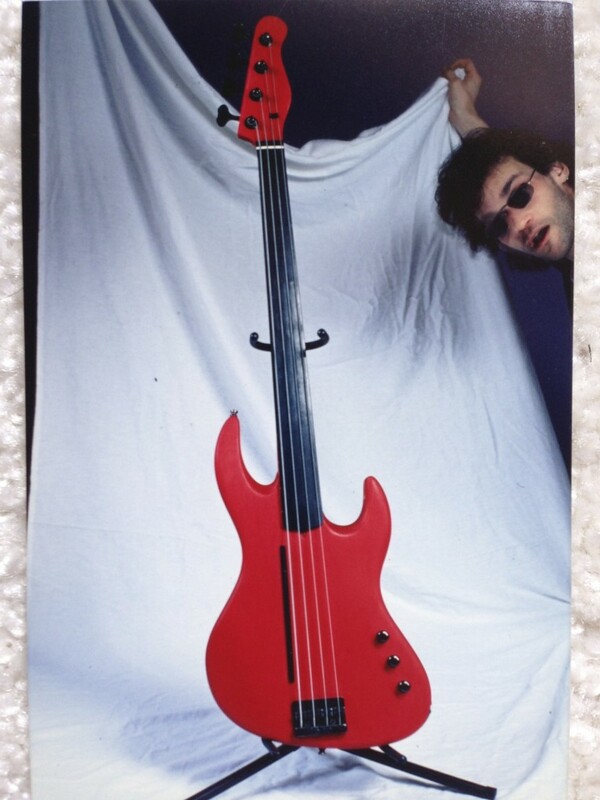 And then one day, I must have had too much time and nothing to do and changed the outfit of the bass from black varnish to red stained waxed wood. What a mess that was. I hated the job of taking the paint off, it took hours. I remember the first stroke of sand paper on it. It’s when you start something you get to this point where there is no turning back, no ‘undo’ key to be pressed and you just have to continue. I was over that point. I took al the varnish off. I also sanded the back of the neck down to to make the neck a bit thinner and no varnish on its back slowing me down. Impressed by some Ibanez body shapes I also rounded off the sides of the cutaways to make it look sharper. I think the best head shape of any guitar is the Telecaster shaped form (if there is a head that is) – luckily enough Godin did that already. 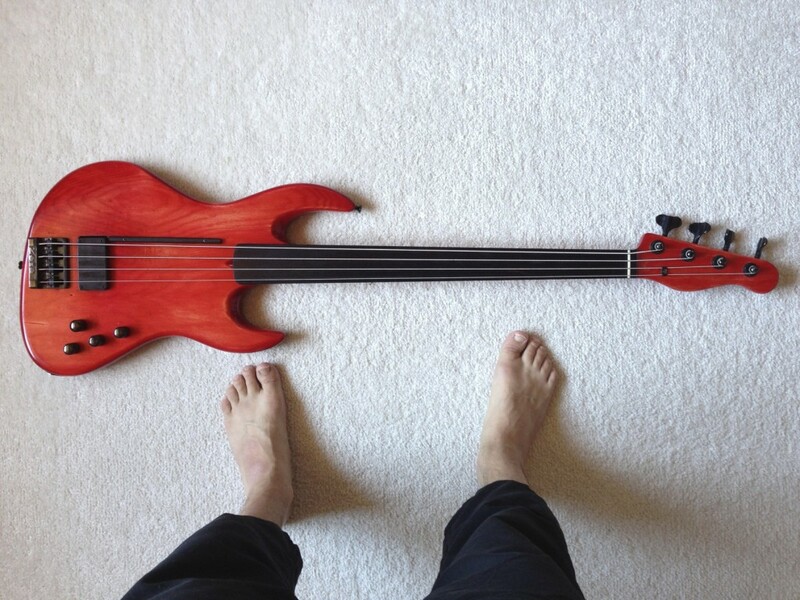 I could have been totally satisfied if there weren’t a few other problems with this bass. One was that when I was playing and sweating the red stain wear off and ended up on my shirts. And as I said earlier, I was never totally satisfied with its sound coming out of the piezos. But when listening to its dry sound it was singing and sounded fantastic. The piezos cannot translate any of the cool sounds that this bass can produce. I am missing the growl and mwah out of the amplifier but I knew it’s there when playing dry. I wanted this sound over an amplifier. So in 2013 I started my update program for this instrument. First I contacted Godin trying to find the usage of the internally unused connectors of the circuit board. They sent me a plain schematics file they found for the electronics of this special bass guitar. That’s all they had. And it was enough. I discovered that Zeta who build the circuit were well prepared for all sorts of connections. The addition of two magnetic pickups and even a buffered output from every single string. This would have given me the possibility to add a 13-pin socket for Axon and Roland synthesiser gear like the Roland GR-55, VB-99 etc. Maybe another time, I decided that I will add one magnetic pickup in the bridge position. Any synthesised sound would not make up for missing sound. Godin Z-1 refurbished, isn’t she beautiful? No Headphones Out? Use the Line Out!